Chen Huixian will finish teaching the 5th and 6th sections of the 74-posture Old Frame First Routine (LaoJia Yilu). This form is thought of as the mother of the other styles of Taiji. 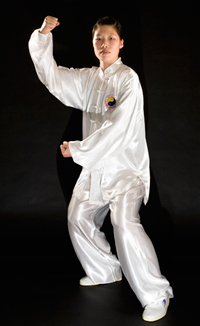 Lao Jia Yi Lu is an excellent starting form, usually performed slowly by beginners and is designed to promote concentration, condition the body and acquaint students with a set of motion techniques crucial to attaining martial arts skill ing Taijiquan. Chen Huixian will be teaching the LaoJia Yi Er form (Old Frame Second Routine) also known as 'Pào Chuí' or 'Cannon Fist. Both Laojia Yilu and Erlu forms contain a balance of hard and soft movements. However, while Yilu focuses on the softer movements, Erlu emphasizes the harder, faster movements. The Laojia Erlu or ‘Cannon fist’ form is full of fast movements, low postures, hard kicks and punches, sweeps, and jumps, balancing the explosiveness of Fajin energy with the slow and spiraling silk reeling energy. ‘Cannon Fist’ also focuses on expressing not only the four linear energies of Peng, Lu Ji and An, but also the four diagonal energies of Cai, Lie, Zhou and Kou. Chen Huixian will be teaching Chen Taiji Push Hands training techniques. 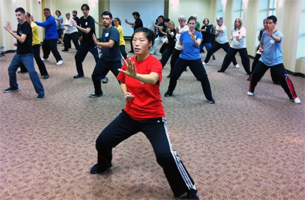 These are partner exercises that bridge the gap between Taijiquan forms and combat / self-defense applications.